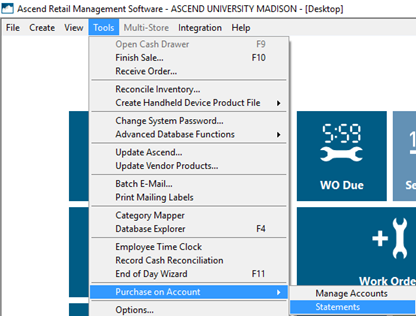 From the Ascend Desktop, select the Tools menu > Purchase on Account > Statements. In the Format section, select the level of detail you wish to include on invoices. a. Statement only: Display only a summary of charges to the customer’s account. b. 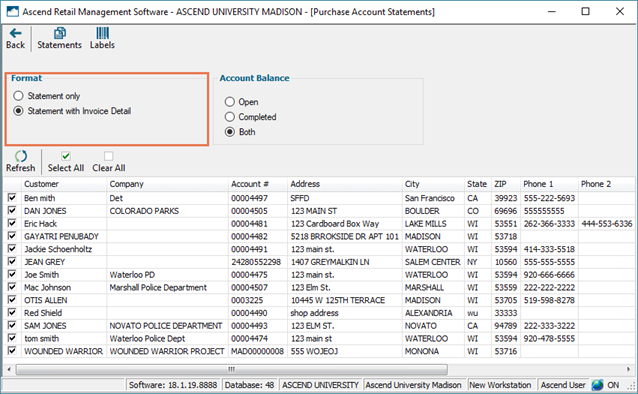 Statement with Invoice Detail: Attach the full-page invoices (large receipts) for each transaction. 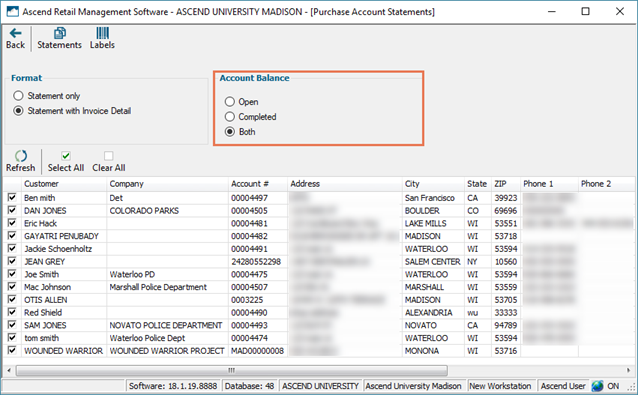 In the Account Balance section, select the transactions you wish to display on invoices. a. Open: Display only charges/transactions which have not been fully paid off. b. Completed: Display only charges/transactions which have been paid in full. c. Both: Display all charges/transactions for the customer’s account. Check the customers you wish to print invoices for. To check all customers, click Select All on the lower toolbar. To uncheck all customers, click Clear All. To print address labels for customers, click Labels on the upper toolbar. a. Print: Print labels directly to your label printer. Select All Accounts to print labels for all Purchase on Account customers, or Selected Statements to print just the checked customers. b. Preview: View labels before printing. Select All Accounts to print labels for all Purchase on Account customers, or Selected Accounts to print just the checked customers. On the upper toolbar, click Statements. a. Print: Print all statements directly to your report printer. b. Preview: View statements before printing, print to a different printer than the one configured in Options > Reports, save statements as PDF files, or email statements to customers. I messed up a sale/payment. How do I fix it?